ETNZ through to LVAC Finals! Home/All News/ETNZ through to LVAC Finals! The comeback Kiwis are into the final of the Louis Vuitton Challenger Series, Emirates Team New Zealand knocking out Britain’s Land Rover Ben Ainslie Racing with a combination of pace and poise in their rebuilt boat. Then came the pace. Foil problem sorted and back up to full speed, Peter Burling climbed into the chase. 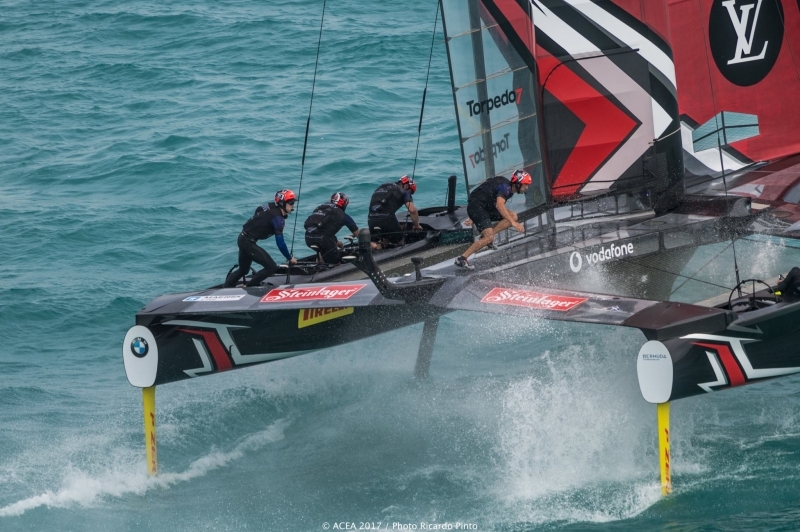 The Kiwi boat ate steadily into the British lead before swooping past on the second upwind leg en route to a 31”win and a 4-1 lead in the first to five series. But with their backs to the wall and facing elimination the British fought back. Sir Ben had the better of the start and set off on what would be BAR’s best race of the regatta. With two less tacks and sailing 500 fewer metres the British completed what they called a super-clean race to go to 4-2. Burling’s response was to discard his earlier conservative approach in the start box and take the game to Ainslie. The young Kiwi cleaned him out and Emirates Team New Zealand streaked off around mark one 8” up. There’s no rest for the other semi-finalists, with Softbank Team Japan and Artemis from Sweden still in a 3-4 scrap. They sail the decider tomorrow before the final starts on Saturday with Burling ready for more very close racing.